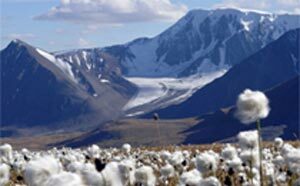 The Tavan Bogd mountain range in far Western Mongolia comprises of dozens snow-capped peaks of above 4000 meters. In Mongolia, one is quickly swept away by the endless green steppes, the heartiness of the Kazakh nomads and the Altai Mountains' rolling landscapes. Here Mongolia Expeditions offers its “Ultimate Mt.Khuiten” mountaineering tour to both professional and amateur climbers. The route includes the highest point of Mongolia, the 4374m Khuiten Peak overlooking the frontiers with China and Russia. Other peaks discovered include Mt. Nairamdal 4082m and Mt. Malchin 4050m. The rest of Tavan Bogd’s valleys, glaciers and snow-capped peaks have not practically been climbed and include mountaineering routes of various degrees of difficulty. To these unnamed peaks we organize new mountaineering tours on request for passionate climbers and trekkers. With about 50% of the country being mountainous, Mongolia has great scope for Mountain trekking and climbing expeditions. We have literally hundreds of peaks over 3000m and several over 4000m. Mt Khuitan is the highest at 4374m and Mohkhairkhan second at 4360m. The highest peaks are in the far West, Hovd and Olgi Aimags. Other high peaks can be found in The Hangai Range in the Centre and in the Northern Region of Hovsgol. In the Centre are the Hangai Range in Arkhangai Aimag and in the North are the Horidal Saridag and Sayan Ranges. Ulaan Baatar is located next to the Bogd Khaan Uul (range) the oldest protected area in the world. Here Silk Road Group offers its “Ultimate Mt.Khuiten” mountaineering tour to both professional and amateur climbers. The route includes the highest point of Mongolia, the 4374m Khuiten Peak overlooking the frontiers with China and Russia. Other peaks discovered include Mt. Nairamdal 4082m and Mt. Malchin 4050m. 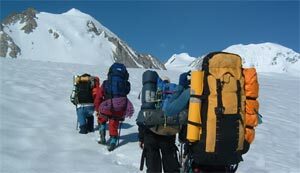 Expedition is similar to challenging treks, however, includes basic mountaineering above the snow line using ice axe, crampons ropes and necessary climbing gears under the supervision and instruction from the climbing leader/guide. People wanting to do this type of expedition needs psychological and physical stamina plus prior experience is certainly an advantage, but not essential. Please write us of your requirements and we shall forward to you more detail with approximately cost.